I’ve always loved mythology. I’ve read Greek, Roman, Norse, Egyptian, and middle eastern. But one of the books I loved, long ago, was of Norse mythology. And as usual, Neil Gaiman delivers. The gods here are more equally represented, although Thor and Loki do manage to take up a lot of space in the stories. But these aren’t the gods as presented by Kirby and Stan Lee, and dialogued by Stan Lee’s brother Larry Lieber. These are the true Norse gods, terrible, dangerous, ancient, and to be called on only at your peril. Loki is not conflicted, but definitely without remorse. Thor, well, red bearded and not so bright. Odin is a dark, brooding wise and terrible. Even the goddesses are not entirely one sided. The forward is worth reading for the origins of these particular stories. The author points out the melding of religions in the battles of the gods of the Vanir (brother & sister nature gods) and the Aesir (who we usually think of as the Norse gods.) There is included a story about the battle, and how they made peace. He mentions all the lost stories about goddesses, that he’d have liked to have included. The sources he used and didn’t use. And then there are the progression of the stories. He begins, with a creation story, of fire and ice, and of course ends with the end story of Ragnarök, which is also a beginning. All the stories are set in a mythical, setting, Midgard is Earth, where the humans (mortals) dwell, and Asgard where the Aesir dwell, a world where the light elves dwell, a world where the dwarves dwell, and one where the ice giants dwell. There are nine worlds. And no one seems to be able to stay in their own world. Which of course, causes many of the problems in the stories. The stories do run in a progression, from creation to a sort of ending of an old world. They can be read as short stories, or read as a longer narrative. One does lead into the next. Neil Gaiman called the stories a journey. And so they are, a journey to a culture long gone. 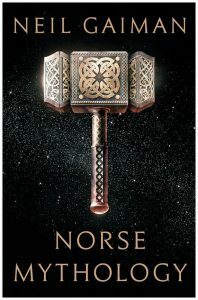 This entry was posted in Books & Reading and tagged Friday Reads, Neil Gaiman, Norse Mythology. Bookmark the permalink.